Oyster Automatic Satellite Tracking Systems Overview - Pinktronix Terrestrial & Satellite Television Installation Services. The Oyster CI System Overview – Component Breakdown / How it works. In its most basic form an auto acquire satellite system will consist of a motorized dish and control electronics to command the dish servomechanisms, (actuation devices with positional feedback) which aim the dish at the satellite appropriate to the TV or radio service selected. Generally the systems will search for the satellite on the basis of two main electronic parameters. 1) FREQUENCY, Which can be analogous to the frequency search you do when you look for a particular radio or TV station as you twiddle the knobs and dials. 2) SYMBOL RATE, Which is really the number of blobs per second in a digital transport stream, but which can be analogous to say, the particular program material on a particular TV station. 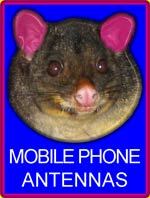 Thus in our analogy, if we select TV North Korea on Optus C1 while we are parked at Gympie, the system will search for continuous communist propaganda on a satellite frequency of say, 12700 Megahertz. During installation the Oyster system software will have been set up with the positions of all pertinent satellites relative to your itinerary or main residence. 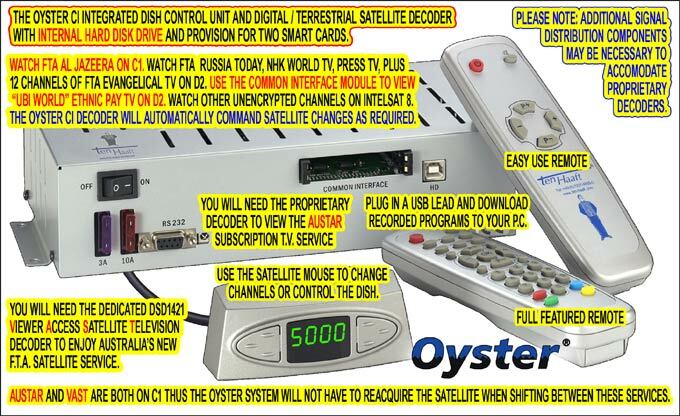 Keeping with our analogy, after you couch potato in the van and select TV North Korea, the Oyster dish will deploy and begin looking for a continuous flow of communist propaganda on a frequency of 12700 Megahertz. It will rotate the dish and search thru 360 degrees changing elevation in small increments, until eventually it locks on at an elevation of 59 degrees and an azimuth of minus 3.2 degrees away from magnetic north. 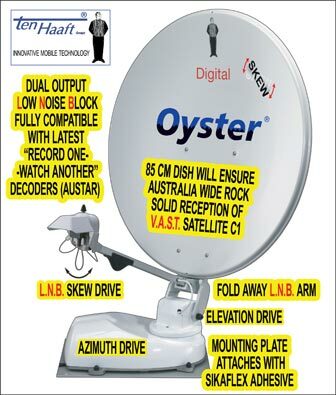 Finally the Oyster will rotate the Low Noise Block to maximize alignment with the satellite transmission, then the dish signal will be switched to the satellite decoder, and one of the Kims (either living or dead) will appear on your TV screen. Also, it’s true that there may be more than one transponder carrying continuous communist propaganda on a frequency of 12700 Megahertz and that you may well finish up on the wrong satellite with TV images of Fidel Castro or Che Guevaraz but this is highly unlikely for several reasons. 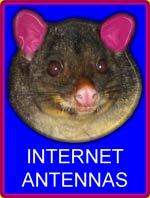 All satellite transmission parameters are closely monitored and controlled by international bodies and conventions. The homing frequencies and symbol rates for your Oyster system are carefully chosen to avoid duplicated parameters. Some manufacturers of automatic satellite systems sought to make dishes home on a continuous stream of unbroken political promises at the designated transponder frequency, but unfortunately there was no such transmission on any frequency. 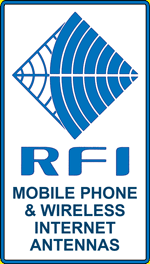 Experience has proven that a combination of transponder frequency and symbol rate are still the best parameters to enable the dish to accurately lock onto the selected satellite. Referring back to the intro: “In its most basic form an auto acquire satellite system will consist of a motorized dish and dish controller electronics”.